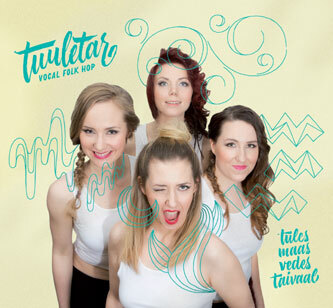 mwe3: Tell us about the making of the new Tuuletar CD. Is this the first Tuuletar album? Tell us the process like, from writing and composing and perfecting the performances leading to the recording and what were your impressions of recently visiting New York and recording in North Carolina? Sini Koskelainen: Yes, this is our debut album! Some of the songs in the album we already started writing a few years back but they have slowly changed their shapes and have grown to be more mature for this album, like we all have, as individuals in Tuuletar. Creating and arranging a song varies in our group. Whoever gets the inspiration can bring a song or a complete arrangement that we then start to work with. Some songs have been composed and arranged by one person, other songs have got their lyrics from one person and composition from another. Some songs, like Kohma have been collectively made through improvisation with a draft of text. Most of the songs are arranged together. 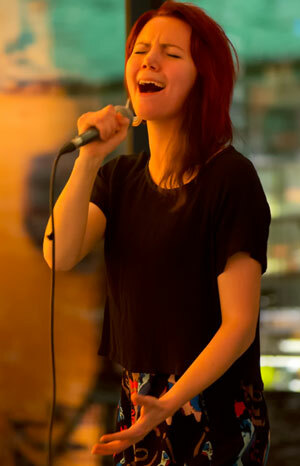 Beats in every song are created and developed by our beatboxer - Venla Ilona Blom. We didn't want to rush with making a debut album. We wanted to feel that our music had evolved enough to be under the same roof that we call Folk-Hop. For us it was also very important to find the right kind of people to work with. People that would respect our visions but still have the courage to suggest their own point of views and show us new dimensions production-wise. We feel that Liquid 5th, the company that recorded and produced our album in North Carolina, was the best choice that we could've made. The people of Liquid 5th - Chris Juengel, Carl Taylor and Josh Chopak are lovely, professional and skillful people that do music from their hearts. 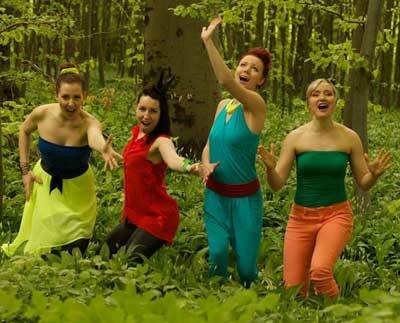 They are also all specialized in acappella music, which is quite rare here in the Nordic countries. We created a lifelong friendship with them, which we truly appreciate in the music business world. It was destiny, I would say, that we were chosen for the acappella competition in Graz, Austria called Vokal last Summer, and met Josh from Liquid 5th there, and won the Silver in the POP-category plus one of the audience awards. After that, it was our determined will to believe that our music had a bigger future ahead, and that it would reach and touch people despite singing in our Finnish language and that started to produce results. All our past struggles had made our groups identity even stronger, leading us finally to something bigger. A couple months later, our booking agent Johanna Sauramäki and Venla from Tuuletar met Aija and Jyri Lehtonen from Bafe's Factory record label in WOMEX - the world music expo - and not so much later we signed a record deal with them. Our New York City visit was awesome! It was wonderful to perform in Scandinavia House and enjoy the vibrant city that never sleeps. One of my own personal dreams also came true, was when we got to see the Lion King Musical on Broadway! Were looking forward to traveling to the U.S. Again! mwe3: How did you come up with the name Tuuletar and what does the CD title mean in English? Tell us about singing in the Finnish language. Are you hoping to breakthrough into the pop, World Music or experimental music genres or all three? Seems like Tuuletars music is quite accessible even though its sung in Finnish! Do you think it would quite change the sound and vision if you sang it in English? Where do you get your lyrics ideas for the songs in Tuuletar and can the songs be translated into English? Sini Koskelainen: The name Tuuletar came from our mutual will to find a name that would represent a Finnish mythology. We went through a Finnish Kanteletar poem collection until we found a name that felt like us. Tuuletar is either a female spirit of the nature that controls the wind or a wind's personalization. The CD title is tules, maas, vedes, taivaal which means in the fire, in the earth, in the water, in the sky. One is fire, one earth, one water and one air. We are very different individuals as persons but somehow something special happens when we get together. That's why we wanted to give the album this name. It contains all of the four elements. I feel that we suit all of the 3 genres; world music, pop and experimental. We would never switch singing completely in English. The Finnish language is an important part of our musical identity. There would be no Tuuletar without Finnish texts! At least that's how we feel right now, who knows what happens in the future? Texts and lyrics in our music get their inspiration from nature, strong female characters, from hope, joy, growth and conflicts of the mind. Inside the album cover booklet there will be short descriptions of the texts in English that takes the listener to the right kind of atmosphere before the song starts. mwe3: Finland always had a number of great pop singers. What artists from Finland had a major influence on you growing up and which of todays Finnish artists are you in tune with so to speak? What musicians, groups and artists from other countries, say from Sweden, the UK and the US also influenced you? for example Nylon Beat, The Rasmus, Hanoi Rocks and Bomfunk MC's of the Finnish artists. But I don't know if they had a major influence on me. Maybe Nylon Beat although, affected me so that I got encouraged to create an all-girl-band where I started to write songs, at the age of 9. I mostly anyway listened to foreign music. My musical tastes changed dramatically quite often while growing up. As a teenager I listened to Mariah Carey, Spice Girls, Backstreet Boys, Snoop Dogg, Aaliyah, TLC, Destiny's Child, Michael Jackson, Justin Timberlake and Stratovarius, for example. When I was passing my teenage and reaching the adult age I started to be influenced by Björk, Beyonce, Sainkho Namtchylak, Yasmin Levy, Peter Gabriel, Thom Yorke, Nina Simone, Sigur Ros, Erykah Badu, Hans Zimmer, Thomas Newman, The Boxettes, B.o.B, Avicii, Angel Haze, Eivør and Arvo Pärt, among many others. Nowadays I'm inspired by Kimmo Pohjonen, Pekko Käppi, Wimme Saari, Paleface and Paperi T of all the Finnish artists. mwe3: Its hard to believe that the whole Tuuletar album is human voices only as its so creatively done. Is there a lead singer even though all the members sing? it varies from song to song. mwe3: How did you come upon the art of beat-boxing and can you explain what that is and how would you describe the Folk-Hop sound? Is that the only percussion on the CD and does anyone else plays on the Tuuletar CD? 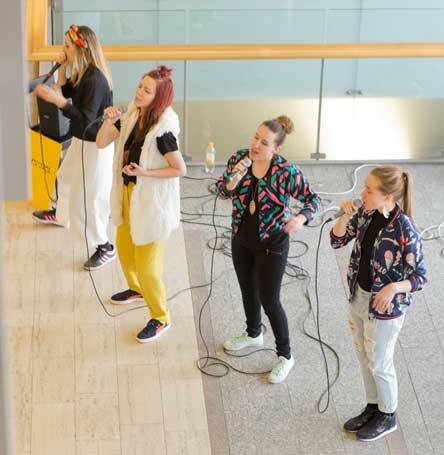 Sini Koskelainen: The story of beatboxing in our group started from testing out independently some vocal percussion sounds in Aarhus, Denmark where we originally met each other four years ago. Then it evolved into real beatboxing when Venla started to have a huge interest in that world. She started to practice a lot by herself and then take lessons from professional beatboxers all over the world. The Boxettes hadand still has even though they have split upa great influence on us! The group is all-female-group from UK, and they also have an amazing female beatboxer called Bellatrix, and that inspired us even more. Beat-boxing is a form of vocal percussion primarily involving the art of mimicking drum machines using one's mouth, lips, tongue, and voice. The Folk Hop sound blends Finnish Folk Music tradition with hip hop, electronic music and world music. 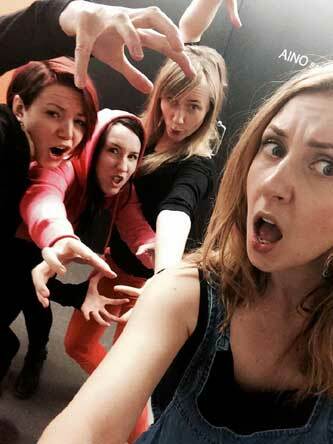 There are no instrumentalists on our album, only us four using our voices in different ways. There are just a lot of tracks top of each other, that's why the soundscape sounds so big. Only mechanically added things that appear on the album are effects like reverb, delays and octaver effects. mwe3: Who is in Tuuletar, what is the chemistry like between the members and how did the band meet and work up such an instinctive recording methodology? You must practice a lot! Looking at the videos, it seems like youre also very into choreographing the performances. Dance moves seem very intrinsic to the Tuuletar sound. 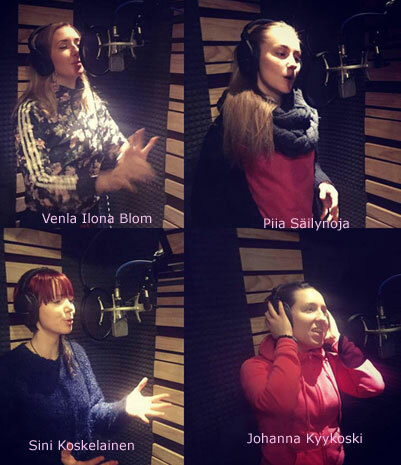 Sini Koskelainen: In Tuuletar there is Venla Ilona Blom who sings and beatboxes, Piia Säilynoja who sings, Johanna Kyykoski who sings and me, Sini Koskelainen, who sings. Chemistry between us is explosive, caring and energizing. We met in Aarhus, Denmark at the Royal Academy of Music in 2011 when we all studied there at the same time for one year. Yes, choreography will even play a bigger part of our performances in the future. We have just hired a professional contemporary/street dancer to create choreography for us. mwe3: The production of the Tuuletar album is brilliant. It sounds so well done and well produced. Tell us about how Liquid 5th Productions in the US became involved in the Tuuletar album and how did the production shape the album sound? Who at Liquid 5th gave the album such a great sound and what was it like recording the album in North Carolina? Sini Koskelainen: I totally agree! Like I mentioned previously we met Josh Chopak of Liquid 5th last Summer at Vokal in Graz, Austria. He came to talk with us and was really interested in making a collaboration. After tons of emails back and forth with legal rights etc. we finally made a deal with them to go to North Carolina to record. With the help of creative hands of Chris Juengel and Carl Taylor, who were responsible of the recording, editing, producing and mixing of the songs, our music reached a deeper and higher dimension. Mastering was done by Eric Scholtz. It was wonderful to record the album in North Carolina! Liquid 5th had fantastic studio facilities and great and encouraging work energy. mwe3: What other plans, concerts, writing and recording plans do you and Tuuletar have for 2016 into 2017? Where would you like to take your music next? Sini Koskelainen: This Summer and Autumn we're performing in different festivals like Budapest A Cappella Festival (Budapest, Hungary), Spectaculum Mundi (Munich, Germany) and Göteborgs Kulturkalas (Gothenburg, Sweden). In the Autumn 2016 we will start touring around Finland performing in schools our self-made children's music show The Maiden of The North and the stolen gold threads. Our show is booked by the Concert Center Finland Association. The songs will be from our own repertoire. In 2017 we are going to tour a lot in Germany, we are booked by Goethe-institute, Germany's worldwide cultural institute. We are also having a tour in Taiwan in the Autumn 2017 and we have plans to travel back to U.S. next year too!